This figure was obtained driving normally to enthusiastically with air conditioner on. Tires are inflated at 260kPa in front and 250kPa in the back. I coast a lot. Instead of braking hard I rather coast if I see a robot change. I also "feather" the pedal. I've adopted an efficient driving style and don't even need to think about it anymore. I would very much consider this a "real-world" figure. I own a 2006 Prius that I bought in May of 2007. First released in South Africa in 2005, the Prius was the first hybrid vehicle to be sold here. Initially Toyota only allowed the Prius to be leased, not owned, but later changed their minds and people could actually own one. Before my Prius, I owned several BMWs, but eventually fuel consumption and reliability issues started cropping up. I was attracted to the Prius by its' looks and the technology. I've always secretly wanted an electric car and here, finally, was the closest thing, a hybrid. I first test drove a Prius in April of 2006, but wasn't able to afford one until a year later. In 2007 a new Prius cost R270 000, but I was lucky to find a demo Prius in Paarl for R220 000 that had 30 000km on the odo. At first the interior of the Prius was somewhat alien to me and very hi-tec. Up to that point I've only driven cars with needles, gauges and dot-matrix displays. The Prius was completely different. With the car off the cluster is completely black. There is just this black strip beneath the windscreen and a black TFT screen in the middle. Press the power button though and the cluster comes alive. 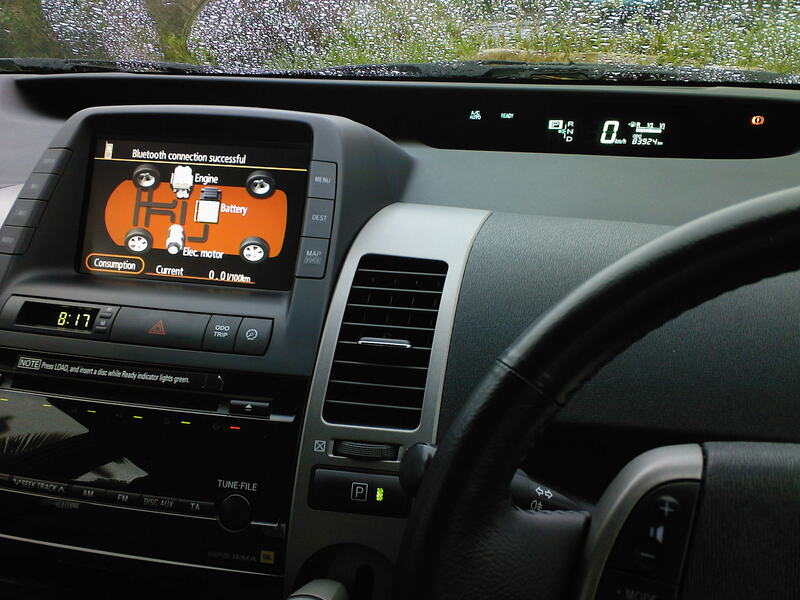 The green gas plasma display appear from the drivers' perspective to be at the level of the wipers, somewhere beyond the surface of the cluster. 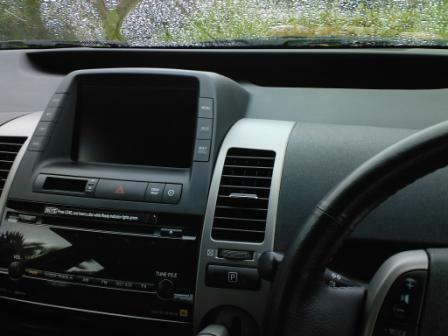 Toyota managed this through a clever mirror arrangement that reflects the gas plasma display, mounted inside the dashboard, up and into the drivers field of view. It makes driving more comfortable as you don't have to shift your focus so far to look at the speedometer and then again at the road. The centre console contains a touch sensitive TFT monitor that provides the user interface for the climate control, audio, sat-nav and Bluetooth. Below that is a CD loading slot for the 6-disc CD changer. The JBL sound system uses a CD changer that swallows all the discs one by one instead of using a cartridge. Buttons and knobs are provided for direct control of FM, AM, CD, tuning and volume. To the right is the gearshift selector and Park button. The steering wheel have buttons for volume control, audio system mode, channel/track select, temperature, recirculate and telephone. There's also buttons to display the energy monitor and fuel consumption history. The voice command system is also accessed via a button on the steering wheel. To the drivers right are buttons for the electric windows and electric door mirrors as well as the central locking. The parking brake is foot operated. On the passenger side are two glove compartments, one that opens downwards and another on top that open upwards. The centre armrest hides many more storage areas. The Prius interior offers plenty of space. The boot is enormous and offers an extendable roll-up cover. With the rear seats folded flat the Prius can swallow truly enormous loads. 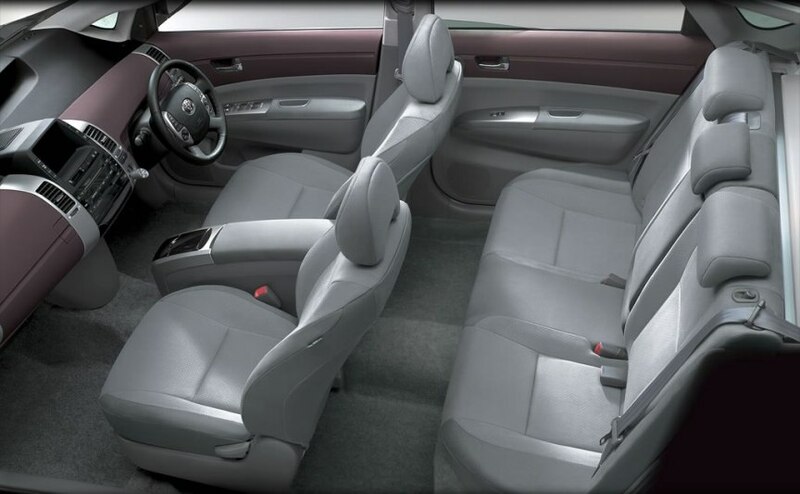 The cabin also sports passenger and driver front, side and curtain airbags. The Prius also sports a EURO NCAP 5 star rating. Driving a hybrid requires no special knowledge or skill. The Prius doesn't have an ignition and key in the normal sense, rather the Prius has a "Power" button. 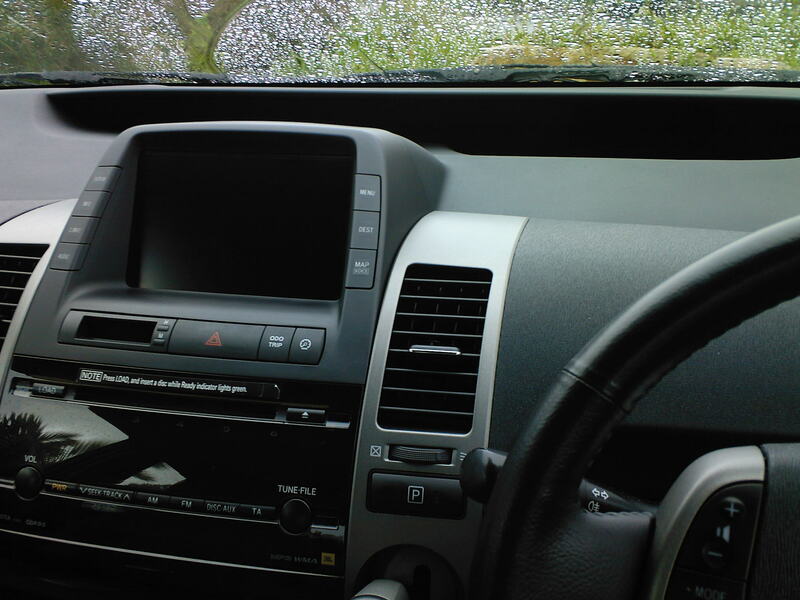 With your foot off the brake, press the power button once and the radio and screen become active. This is equal to position one on a normal ignition. Press the button again to power up the ancillaries like the air conditioner. To start the car you have to put your foot on the brake and the press the power button. You know the car is ready to go when the "Ready" indicator on the cluster lights up. Even then, don't expect to hear the engine running because it's not. With the "Ready" indicator on, push the gearshift joystick to the "D" position, while pressing the brake pedal. The joystick doesn't stay there however. Once you've selected the gear the selector will jump back to the central position. So, with the "Ready" on and the car in "D" press on the accelerator lightly. The car takes off without a sound. That's because only the electric motor is powering the wheels. Press a little harder though and the engine will kick in seamlessly. The Prius uses stored electrical energy for initial acceleration after which point the hybrid drive system will seamlessly add the petrol engine element. The gear selector is located to the left of the steering wheel. It's more like a joystick though as there is no mechanical link to the car. Above the gearshift selector is a button marked P, for parking. This has the same function as the P setting on a regular automatic gearbox. All the other settings R, N and D are similar. B requires some explanation though. When you go down a very steep incline like a mountain pass, the Prius will use the motors as generators and dump energy back into the battery. This has the effect of slowing the car down. Sometimes though "regen" does not slow the car down enough. The "B" mode will allow you to force the car to run against engine compression, thereby saving your brakes. Many people think "B" is for battery. That is not true. This is one of the most confusing features of the Prius in my opinion. I almost never use the B setting. I've noticed that the Prius will go into running against engine compression automatically if the battery should become full during a long downhill. So where does the key go? Well that's an entirely different story .Remember I said it's not a "key" in the normal sense. That's because it actually looks more like a garage door opener. A small black box with buttons on it. This key fits into a small slot on the right of the steering wheel. Once the key is in the slot you can power up the car. What if the keys' battery runs down. No problem. The key fob hides a real key inside. This you use to unlock the door normally. At this point the alarm will go off. To silence the alarm and activate the car you place the key fob transponder in the key slot on the dashboard. The car then powers the key fob and reads the security code from the electronics inside. You've seen stealth planes and helicopters? The Prius also has a stealth mode. Well kind of. The Prius has a special button marked "EV". This stands for electric vehicle. If you press this button, you'll force the Prius to stay in all electric mode. This makes the car super quiet. You can drive a short distance and at speeds up to 45km/h without making a sound. The onboard computer can always override the EV button. It will never allow the battery to become too discharged. To prevent complete discharge the engine will come on automatically to recharge the battery. Curiously enough the EV button was omitted from the USA version of the Prius. It's just like driving a regular automatic. What happens if I accidentally press the "Power" button while I'm going down the highway? Nothing happens. If you press the "Power" button while the car is in motion or your foot is on the accelerator, nothing happens. Let's say for whatever reason there is a malfunction while you're driving and you HAVE to shut the car off. Pressing and holding the power button will perform an emergency shut-down. The Prius feels very much like a regular 1.8 or 2.0 litre sedan to drive. While the Prius is no rocket, you never get the impression that it's underpowered. Being accused of being underpowered is a problem for other fuel sipping cars such as the Corolla 1.3 or Yaris. The problem is that with a regular small engined car you first have to rev the engine to near 6000rpm to get full power and torque leading to a foot flat driving style. This is especially true at the power sapping altitudes of Gauteng. This makes a vehicle such as the Corolla 1.3 unsuitable as a family sedan. Put four adults in it and it just won't go. The Prius has a secret weapon in the form of the electric motor. Unlike an engine, electric motors provide full torque and nearly full power from 0rpm. The electric motor in the Prius offers 400Nm of torque even before the engine starts turning! This makes for acceleration similar to a Corolla 1.8 or 2.0 D-4D. So even though the Prius has a 1.5 litre engine, you never get the impression that it's underpowered. The electric motor provides extra oomph when you need it. If the battery is full and you attack a steep hill, the motor and engine will propel the car with little fuss. In this case you have the 57kW and 115Nm of the engine plus the 50kW and 400Nm from the motor. The downside has of course also happened to me. If the battery is empty (purple bars) it falls out of the equation completely as a power source and you only have the engine to propel the car up the hill. Not only that but the engine will start to charge the battery, leaving even less power to move the car up the hill. In cases such as this the Prius feels more like a Yaris T1. This sometimes happens in summer. I get in the car and the air conditioner drains the HV battery. There's no time for the battery to recover by the time I attack my first steep hill and I end up with a high revving engine, an empty battery and sluggishness. This situation has never bothered me as it happens infrequently. The upside is that the I can regen all the way down the other side of the hill.